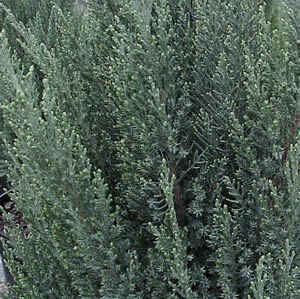 Blue Point Juniper is an extremely dense branching evergreen shrub with a beautiful blue-green foliage with a mixture of awl shaped (juvenile) leaves and scale shaped (adult) leaves. Blue Point Juniper will retain its cone-shaped form well without shearing. Juniperus chinensis ‘Blue Point’ is a moderate grower getting up to 12 feet tall and 8 feet wide. This Juniper is a good choice for screening in the landscape.